The third hull in the 52 metre Sanlorenzo 52Steel series has been sold with West Nautical introducing the buyer. Currently under construction at the Italian yard’s La Spezia facility to a design by Officina Italiana Design, the third Sanlorenzo 52Steel is due for delivery in April 2018. The master suite is located forward on the main deck, with a further four guest cabins on the lower deck. There will also be accommodation for nine crew. Key features include a spacious saloon with huge windows to allow plenty of natural light and a large living space and formal dining area on the upper deck. Notably, the aft deck incorporates a large pool with a transparent bottom, filtering natural daylight down to the beach club below. The beach club has three different opening terraces, to port, starboard and aft, serving as platforms with direct access to the sea. This area can be quickly transformed into a garage with a controlled flooding system for the storage of a tender up to eight metres in length, with the space forward being designated as a customised gym. Twin Caterpillar 3512C engines will give the Sanlorenzo 52Steel a maximum speed of 17 knots and a range of 4,400 nautical miles when cruising at 11 knots. 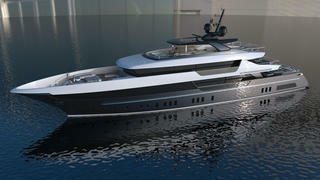 Two 460Exp models and the new flagship Sanlorenzo 64Steel are also in build at the yard's La Spezia facility.